SO...sugar is one of those things that I still can't have a lot of, but every once in awhile, I just want some damn sugar, so the other day I bought myself one of those teeny-tiny one-serving Häagen-Dasz gelatos. One serving for most people is about five for me when it comes to sweets, which I still haven't decided if that's a good thing or a bad thing. I suppose it makes me a cheap date, so there's that. One type of dessert that I absolutely LOVE and miss terribly is tiramisu, so what better substitute than TIRAMISU GELATO?!?! RIGHT?!?! I was hoping so, but unfortunately, this is not quite exactly what I remember tiramisu tasting like. It might just be that I really love the flavor of rum when it comes to tiramisu, but some of the best I've had left me feeling a little buzzed. That rum flavor is slightly present, but the gelato part really tastes more like a slightly caramelized coffee cream flavor rather than a full-on tiramisu taste. The ladyfingers are chocolate rather than the traditional vanilla flavor, and it does add a different dimension to this. Eating one of the chunks alone kind of tastes like eating a soggy piece of Hostess Cupcake off the floor of a convenience store, but somehow eating it with the gelato pulls it all together. It adds a nice, sugary finish to the flavor, with only a small note of gas station floor. You can't win them all! Overall, I probably wouldn't waste my precious sugar resources on this again. It generally just reminded me of what I can't have (real tiramisu) and made me kind of sad. I would much rather have one of their more simple flavors, like strawberry, that are actually delicious, than something like this. Hesitatingly approved. These chips are actually what finally inspired me to start this blog back up again! Currently, Lay's is running a contest where they pit new and old chip flavors against each other. People taste the new and the old, then vote on the website for the one they like better. There are four different flavors - 2 spicy ones (not gonna touch these), 2 BBQ (Honey BBQ vs. Korean BBQ), 2 Kettle Cooked (Sea Salt & Cracked Pepper vs. Olive Oil & Herbs), and 2 cheese flavors (Cheddar & Sour Cream vs. Smoked Gouda and Chives). I thought it would be great to do one of these Lay's challenges to jump back in the snack game! I tried some of the summer contest flavors back in August (Biscuits and Gravy, Reuben, and Gyros) and was somewhat underwhelmed, but I picked up this bag of Smoked Gouda & Chives, hoping that these guys would live up to the really, really delicious sounding name. The ones I *actually* wanted to try were the Korean BBQ, but sadly, they seem to be sold out everywhere in my area. Anyhoodles...on to the chips! They're...ok. Pretty underwhelming, really. It's not that they taste *bad*, per se. It's just that there's nothing exceptional or different about them. They taste about 30% Cheddar and Sour Cream (which they are positioned to replace, if they win the contest) and 70% Sour Cream and Onion. If the contest were to vote on these vs. Sour Cream and Onion, I would definitely say these are the superior chip, but I think Cheddar and Sour Cream is actually a better option than these. Also, despite the fact that these are supposedly smoked gouda, there is very little smoky taste to them, and they aren't particularly gouda-y either. They just taste like any other generic cheese-flavored snack, except with an onion finish. All in all, these are a pretty big WOMP-WOMP if you are expecting some bold new flavor. Lay's, step up your game! Stop making such weenie, boring chips! To be honest, after how bored I've been with all of these new flavors, I think I might stop buying Lay's chips altogether. There are so many other, more exciting brands to choose from. What are y'all's favorites? My partner and I were out doing the very exciting task of shopping for a new vacuum cleaner when they declared they wanted to stop somewhere to grab a quick to-go drink. We were two blocks from a 7-11, so we pulled in and I went inside with them in search of a new snack. Now that I have a small ability to eat snacks, I have to take advantage of it whenever possible! I've probably mentioned this before, but despite the fact that I don't really eat meat, I love a good meat-flavored chip. (But not Cajun Squirrel...never again!) These were the also the only interesting flavor available at this particular 7-11, so I grabbed this bag of Buffalo Chicken Dip chips. 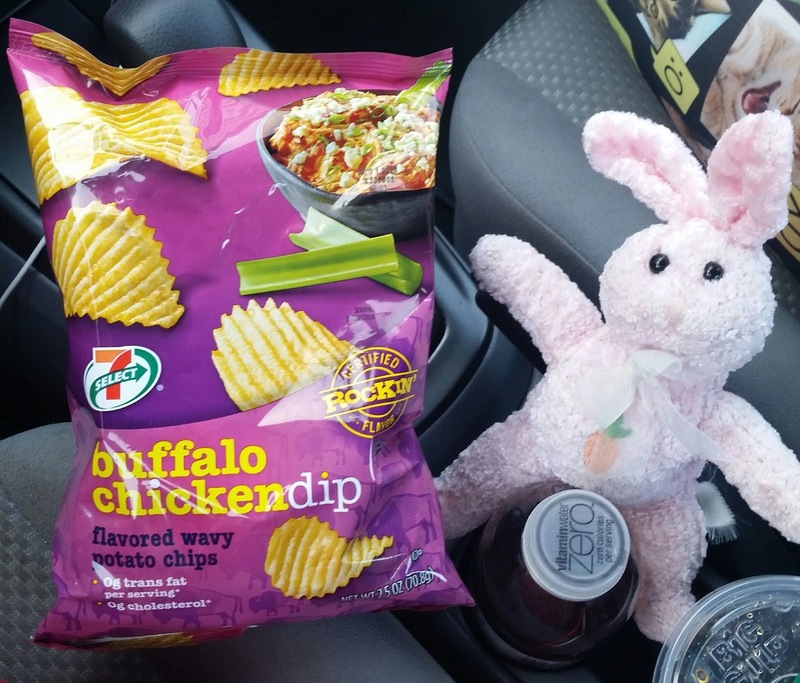 I'm actually not quite sure what buffalo chicken dip is, but I like buffalo sauce, and these chips definitely do that flavor justice. They are mildly spicy, but have that good sweet yet tangy vinegar undercurrent that makes buffalo sauce so good. Somewhere in there, I believe there's a tiny hint of celery and cheese, although I might have made that up based on the picture on the bag putting suggestive thoughts into my brain. Either way, it's good eats. The only potential downside is that they are definitely mild, so if you are into the kind of snacks that melt your tongue out of your mouth like some kind of disgusting flesh volcano, you might be better off with something else. For comparison sake, my sweetie was eating some Flamin' Hot Funyuns, so I had one of those as I was munching on these buffalo chips. The Funyuns were not spicy on first crunch, but had a ton of heat on the end...the buffalo chips are just a steady spice all the way through. I ate most of the bag all at once and didn't get sweaty or sad, and I'm a spice wiener. However, I've been working with many, many competent doctors to figure out why this came up all of a sudden, and I've gotten my health back to the point where I can eat some snacks sometimes! I've been so sad to not be able to blog for so long, so it is with great, great joy and happiness that I say I'm BACK! Also, there might be some videos in the works.......!